Search our database of Dealers and Distributors that are authorized to sell Knoedler products. 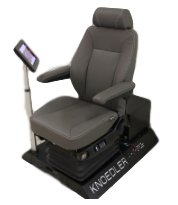 We invite you to visit one of our Dealers or Distributors for a hands on experience with Knoedler seats through our exclusive build-a-seat kiosk. Never has custom building a seat to meet your needs been so easy. Experience the comfort fit of Knoedler seats and design the ultimate seat and feature set that suits your needs. This exclusive list of Dealers and Distributors feature of Knoedler kiosk on their show room floor and are available for custom ordering today.